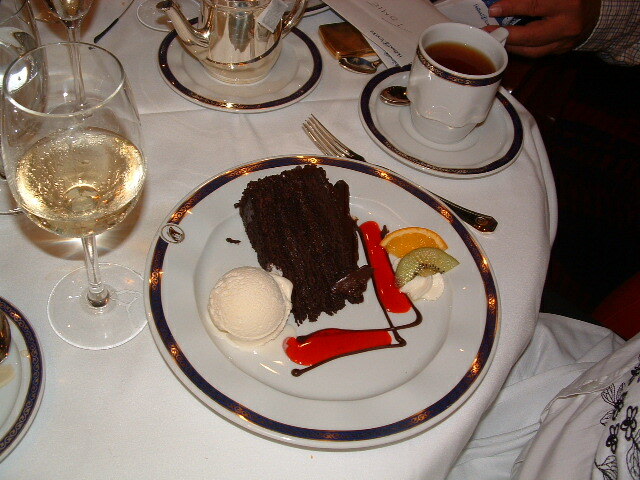 My last blog was about the food on the Crown Odyessey and so I thought I'd do this blog about the cruise food we encountered on our Baltic cruise aboard HAL's Oosterdam. 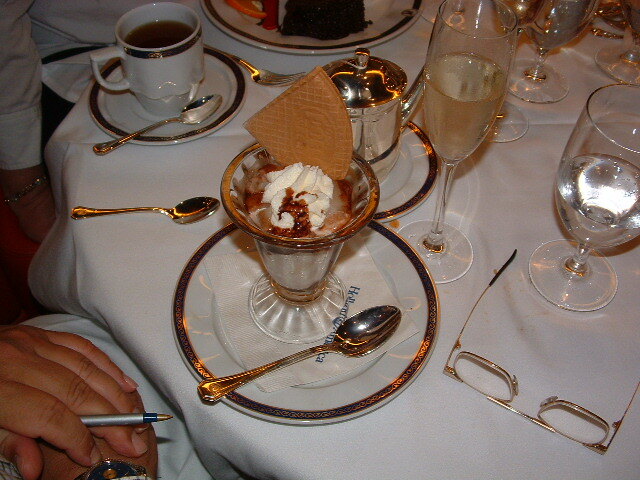 This was our first HAL cruise, and I was very impressed with both the food and the service. 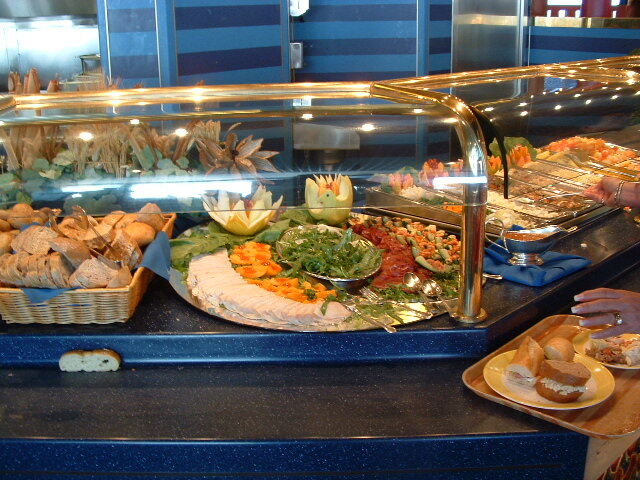 As far as I am concerned Holland America Lines has the best food and service of any of the cruise lines I've sailed with. In the dinning room the waiters were attentive and alert to whatever we wanted. Usually I have a hard time getting waiters to bring me a cup of coffee with my dinner. I have to remind them for several days. On the Oosterdam I told the waiter about my coffee addiction the first evening as I always do, and that was the last time I had to mention it. 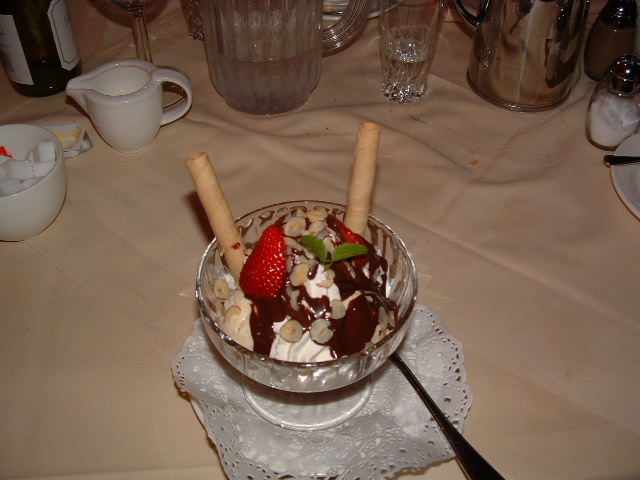 Again, in the dinning room, the presentation of the food was spectacular. We always eat dinner in the dinning room, second sitting, at a large table with a lot of people if possible. We never fail to meet interesting and friendly people at dinner, and dinner at our table is usally more entertaining than some of the shows. Kathy's custome made omlet cooked perfectly, in her opinon, a few potatoes and a couple of link sauges and you have the perfect breakfast, at least for Kathy. As for me, a couple of pieces of french toast and a couple of strips of bacon and I'm good to go. Another thing about the Oosterdam that I found nice was they have trays of fresh baked cookies, really good cookies, out 24 hours a day. 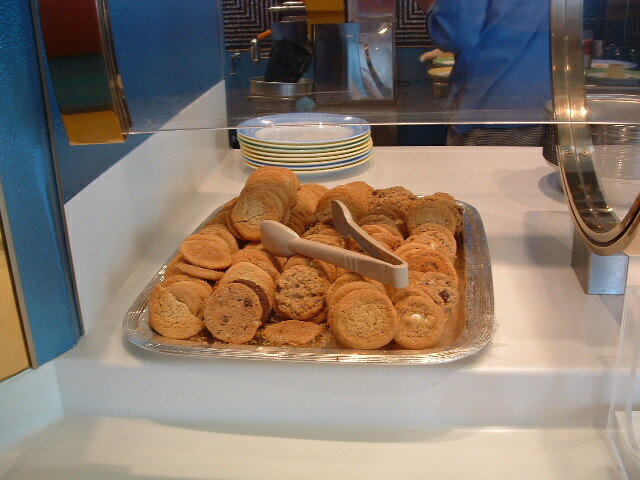 It was all I could do to not grab a cookie everytime I walked by one of those trays. Here is one of those trays of fresh cookies. Often still warm. I especially like the ones with the macadamia nuts in them. The chocolate chip cookies were really tasty as well. 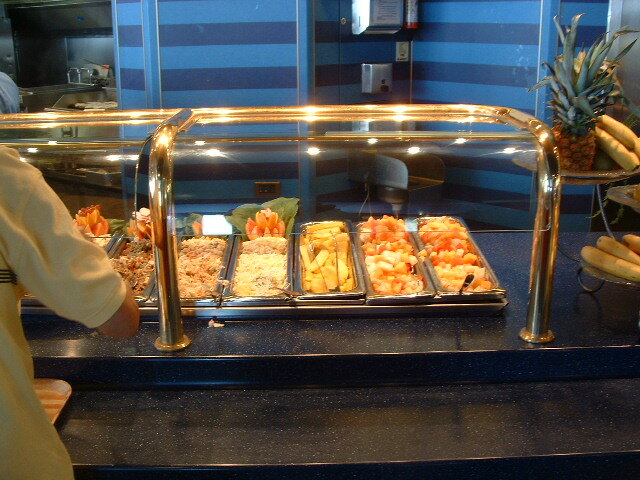 Have to get in a few photos of the buffet lines on the Oosterdam. Chicken on the left and Roast Beef on the right. I think that's enough of the Buffet. There were often buffet lins set up elsewhere like out by the pool. Specialty buffets I guess... tacos, or German Food, etc. There is alwasy the hot dog bar and the pasta bar. 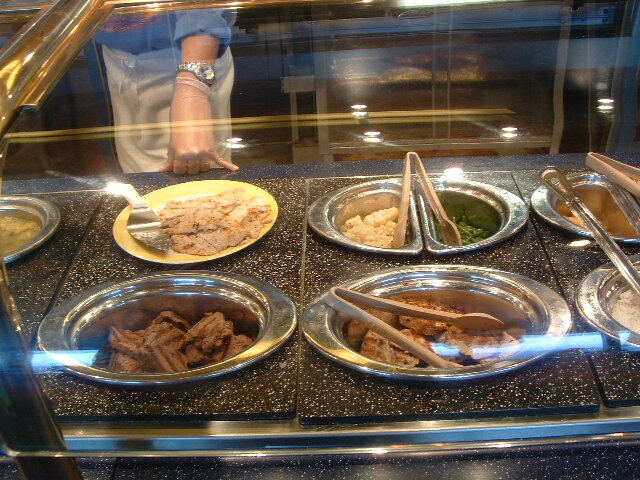 I occasionally had an a la cart plate of spaghetti from the pasta bar... the bolognase sauce was terrific. 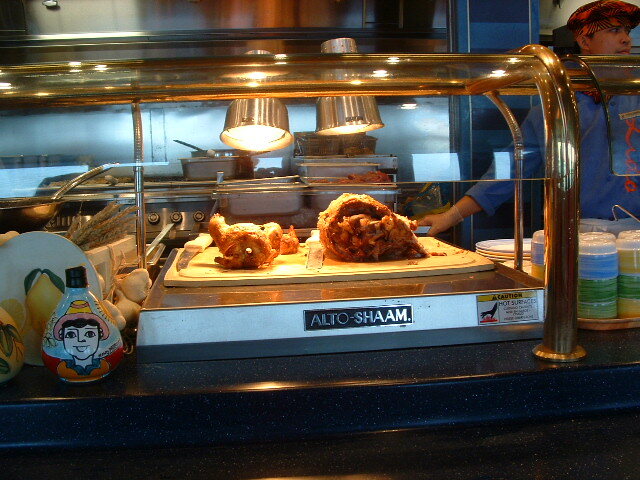 We always have a few hot dogs and burgers from the hot dog bars on our cruises. 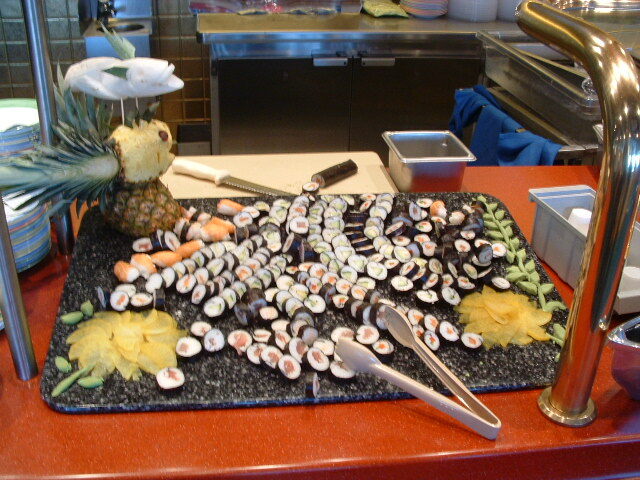 An lets not forget the excellent chinese buffet and the shushi. Food food food, everywhere you look. Cruse Ship Shushi of Course. A German buffet out by the pool. Crab cakes in the dinning room. Presentation. 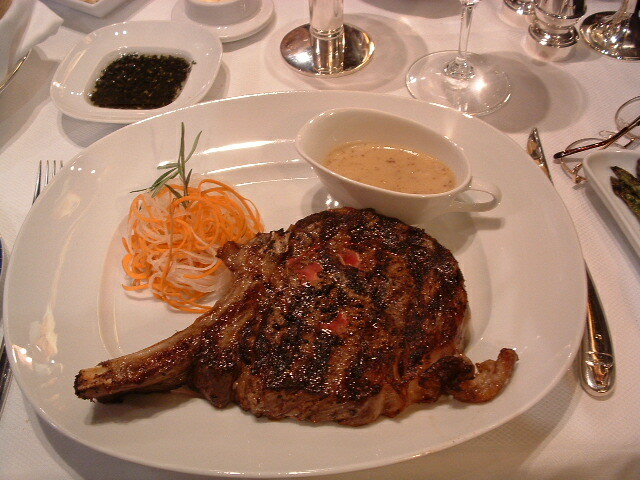 And I will have a perfectly cooked Rib Eye steak please. For you desert lovers... how about chocolate cake and Ice Cream?